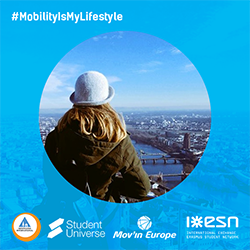 Witten by Ana-Marija Ramić - the winner of "Mobility is My Lifestyle" contest, organised by Mov'in Europe. On 15th January 2017, I started a great adventure. By winning the “Mobility is My Lifestyle” competition organised by Mov'in Europe, StudentUniverse, Hostelling International and Thalys, I got the chance to travel and explore some of Europe's most famous cities: Brussels – the capital of Europe, Paris – the city of light and love, Frankfurt - the major financial centre of the European continent, the Golden City of Prague and last but not least, Budapest – the Pearl of the Danube. The 2-week journey was a huge challenge. Not only for me, but for my family too! This was the first time I was actually travelling alone and the excitement was overwhelming. I found out about the winning the trip on Christmas Eve, and it turned out to be the best present ever. In each country I was welcomed by amazing people from the Erasmus Student Network who took me on city tours and introduced me to more amazing people and their lives as a part of the Erasmus community. And this is my journey. Due to bad weather, my first flight was late so I didn't catch the second plane on time. And I must admit, at first that seemed horrible, but then I got coupons for free food and my second airline gave me more free food; suddenly tragedy seemed like a blessing. Arriving to Brussels a bit later than expected (but with a full stomach! ), I was warmly welcomed by Audrė, the Communication Officer of Mov'in Europe, who then took me to check in my hostel - Jacques Brel Youth Hostel. At first sight, I loved it! It was located in the heart of the city with lovely staff, a cool bar and other spots to hang out! After a quick look around, Audrė showed me the city. We visited many attractions, such as the Grand Place, Manneken and Jeanneke Pis, Royal Palace with Parc de Bruxelles, Fritland (best place for Belgian fries) and of course the Atomium. Needless to say, I slept like a baby after such a long and exciting day. During my stay in Brussels, I also had the chance to meet the fabulous crew of the Erasmus Student Network at their office, where we had breakfast (thank you Gaffar). I was shown around the office and given loads of ESN merchandise. The atmosphere was really family-like and it was so amazing to meet people who are behind this project. I felt like I was really close to tearing up from happiness! After 3 days in Brussels with Audrė, it was time to move on. Paris was the next stop, and this time I didn't fly – I was offered a train from Brussels to Paris. Wonderful, right? Thalys (a high-speed train operator) arranged that movie-like ride. So, in just a bit more than an hour I was in Paris! I was hosted at Yves Robert Hostel - an eco-friendly accomodation located in an old warehouse of a French railway company (it's a wow here!) just a few subway stops from the beautiful Montmartre. The first afternoon I was welcomed by Paul who took me to the Louvre and many other places of which I can't correctly remember the names, but the photos will tell! The next day I met up with Lisa and Julien, who took me on intense tour of Paris. We visited dozens of places, sneaked into Sorbonne University, ate the best bagels and had our eyes always looking at wonderful architecture. After 12 hours of mainly walking and seeing as much as possible in such a short period, I ended my night overlooking Paris from Montmartre, full of positive feelings and just with a tiny bit of pain in my legs. Basically, every night I would pass out on my bed trying to steal a bit of rest before continuing the journey. And the next dawn, it was time to continue. I had a fairy helper, Ombeline, to get me to the airport, and then I sat on a plane to Frankfurt am Main. Frankfurt had a different city vibe from Brussels and Paris, but I loved it all the same. Again located in the city centre (shout out to Hostelling International), in the Haus der Jugend Hostel, and picked up by Aïtem, I had a chance to visit places other tourists wouldn't have a chance to. We also visited Goethe University and student dorms where I had a chance to meet and to speak with many Erasmus students, and there I already made up my mind that I will find a way to become an Erasmus student myself. What I really didn't expect was the amount of Croatian people in Frankfurt. On every corner I could hear Croatian, which turned out to be a life-saver when I was taking the subway to the airport at 3 a.m. Not really the safest and smartest way, but it was definitely an interesting experience. The fact that I met a group of Croatians who live "a village away" from my home in Pula is especially surprising! A few hours after that, I found myself in Prague and settled in Downtown Hostel, which turned out to be the best hostel ever. My host for the city was Andy, and after a tour of the city and trying Czech cuisine, she had to work, while I had to find a way to meet people and see the city even more. Luckily, my hostel had all planned it out! Many activities for their guests, such as family dinner, Ghost tour of Prague and a pub crawl. That way I found myself in a group of people from USA all the way to Siberia and to New Zealand. Some were solo travellers, some groups of friends; some younger, some older; but we all became friends and great explorers of Prague. As my last stop of the journey – Budapest was sugar on top. Cold sugar I must say! The temperatures were freezing and even the Danube River could witness that, but nonetheless I was warmly welcomed by Aventura Boutique Hostel and my city host Ámir. My hostel shared with me some leaflets and because I had a bit more time in Budapest, I joined a free walking tour, again surrounded with people from all around the world. And in the evening a tour of popular Ruin pubs of Pest. As my journey came to an end, I was becoming really emotional. I felt and still feel such gratitude for this opportunity and for the luck I had – literally, every day in every city it was sunny; 10 flights went great; amazing accommodation; amazing hosts; amazing people and a lot of amazing memories. I learned a lot in just these two weeks. A lot about myself (that I need to learn how to cook something more than hotdogs) and a lot about other people and other cultures. It is really hard to put into words what a big impact this had on me. It strengthened me in many ways and it also strengthened my will to continue exploring the world. The biggest cultural shock wasn't even being in 5 different countries in such a short time – it was more of a shock coming back home to my small town of Pula, and being back at the school desk. To anyone that has been thinking about travelling or doing an Erasmus exchange and doesn't feel like they have courage for doing something like this - do it. Just do it. You will experience something incredible and realise you have more courage than you thought. And even though there might be some downs (for example slipping on the icy streets of Brussels, ouch), you will have so many good things coming to you that you will feel like you are floating on a cloud. And here I am, 3 weeks after my journey, still floating on a cloud with a clear vision - that mobility is my lifestyle. And who knows? Maybe it is yours too. Give it a try. No regretting guaranteed. And every person who welcomed me and hosted me in their lives, and to all of those I met on the road as fellow travellers.